I like to cook. Let me repeat, I like to cook. However, I wish I had more time to cook up meals during the week. I do recognize what is preventing me to cook more during the week and I won’t disclose that here. Anyways, I kicked off 2013 with cooking more! It wasn’t a resolution, just finding time to pursue cooking! Here are some of the goodies that I’ve whipped up! · Spinach Lasagna Roll Ups – I’m utterly obsessed with the Skinny Taste blog. I’ve been following it for some time now and seriously save every recipe that is posted to the site. 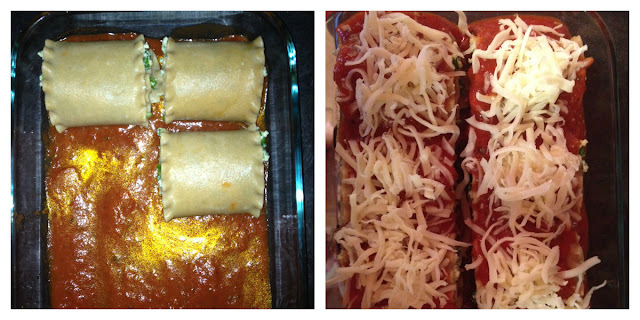 A few weeks ago, I tried these Skinny Spinach Lasagna Roll Ups and boy, they were good…and event better heated up the next day! VERY easy to make. · Cheesy Jalapeno Popper Baked Stuffed Chicken – Of course another Skinny Taste receipt! Reader Dana and I discussed a similar recipe, but I had already booked marked this one, so I tried it. I like spicy things, but the hubs doesn’t. Not sure I’ll remake this one, but it was easy and I thought it was good! I had some other recipes planned, but then the Smithkowski house ended up with the plague, so needless to say we each hated food for a few days! More test & learn recipes to come!